→A guide To Riviera Skateboards – What Should You Expect? A guide To Riviera Skateboards – What Should You Expect? Finding a decent longboard is difficult. Just think about all the premium and entry-level options that are out there. To which one of these does Riviera belong to? In our guide, we review some of their board offerings giving you an idea of whether or not Riviera is a brand worth looking into. 2 How Much Are They? 6 What about the Brand? Board lengths range from 26 to 27 inches, while the width goes from 6.5 to 8.0, making them slightly bigger than your typical penny board. Mostly maple is used for construction, which in turn helps them with sturdiness. Features to be found here include “EVA foam grip”, wheel flares, and kick tails. All the micro minis are top mounted, giving them an agile and lively feel. With boards like these their small size is compensated by their ease of portability. Wheels and trucks usually included with micro minis are “Paris street trucks” and “Divine City Slashers”. The Paris trucks make a suitable choice here as they are one of the most popular aftermarket trucks and have proven to work great for cruising, free riding. The city slashers are appropriate for boards of small size as they won’t rub against the deck and will provide fast acceleration. Although, you may have trouble going over debris and rough pavement. Board lengths go up to 38 inches in length, widths up to 9.5. (Not so mini after all) The construction in minis range from bamboo to maple, keeping them durable while still giving them enough flexibility. Features to be found in the mini decks include drop through mounts, concave, and tails. So you’ll be able to do ollies on/off curbs. Depending where the board is bought from, “Minis” come with “Paris” trucks or generic no name trucks. (I’d suggest you to go with Paris). Wheels usually included are Divine “City slashers” or “Trailblazers”, both are ok for a cruiser. Riviera’s Fusion boards deck lengths range up to 46 inches with widths going up to 10, making them a really good match up to some of the best cruising boards out there. There are boards made of mixtures of maple and bamboo construction. As well as the typical maple construction. Features include wheel flares and kick tails, so they will be resistent to those nasty wheel bites. The larger sizes mounts make these boards more ideal for cruising long distances at higher speeds and free riding. Wheels and trucks usually included are “Paris 180 mm” trucks and “Coyote” wheels. The 180 mm Paris trucks provide a good mix of carving, free riding, and stability in one package. They are a good choice for the types of boards here. Decks are made from traditional maple to bamboo. Features include gas pedals (it’s a longboarder’s terminology for side cuts that let you speed up) concave, tails and wheel cut outs. All boards use a drop-through mounting system. These features make these boards more suitable for freeriding, cruising and carving at high speeds. A typical Riviea Drop-thru board is The La Rana. It has a bamboo construction, concave and a drop through the mount (You guessed it right). The wheels and trucks are Paris and Coyote 70mm wheels, so a quality gear. A couple of pros would be the lightweight bamboo and drop through design, making it great for cruising as It will be lighter to push and lower to the ground. Making it easier to push long distances and more stable. Cons would include the ABEC-5 rated bearings as they are quite slow and it’s recommended to upgrade or replace these as soon as possible for more enjoyment. Another good example is Cherry Blossom. This board also has a drop through mount system, bamboo construction, and mild concave. In comparison to the “La Rana” The 72mm “Divine” wheels are also of good size for cruising. The larger wheels on the Cherry blossom are more favourable as they would be more suitable for cruising and commuting than the 70mm Coyote wheels on the “La Rana”. The ABEC-7 rated bearings will also have a higher roll speed than the ABEC-5 rated bearings. The boards in the combined range have lengths ranging from going up to 38 inches, widths to 9.8, so a good length for a cruiser. Construction materials are of maple here. All boards in this range are top mounted. Features to be found here include wheel flares, concave and tails. Trucks included on the completes in the Combine range are usually Tracker “Axis” 149 mm trucks. Or a variation of Paris street trucks, both of which work ok. As with all of Riviera’s they have some type of Devine wheels, which are not great but better than most. In this category, decks go up to 41 inches in length and they’re mostly made of maple, however, the “Heta” is made from a combination of maple and glass. Features to be found in these decks include, concave, drop through mounts, wheel cut outs and flares. As you would find in most freeride boards. Pockets, tails and symmetrical shapes can also be found here. Usually, these boards will come with Paris 180mm trucks and “Coyote wheels”, which is nothing special for a board in this price range. Depending on where you buy them, Riviera completes usually sit in the moderate price range. That said, they’re definitely not cheap entry level longboards. They do produce a wide range of boards to choose from, whether you like to bomb hills and high speeds, slash city streets, or simply go for a laid back commute or cruise. Riviera will most likely have something for you to choose. Particularly if you are a beginner or simply looking for your next cruise and commute deck, which seems to be their speciality. Riviera’s completes are usually in the mid-range, and provide everything you need to hit the mountains or the city streets.Most complete come with decent aftermarket wheels and trucks. As Paris and Divine wheels will provide much better performance than generic components. Although this can vary where the complete is bought. Since they are affordable, they can be a good option for people who are looking for a board that will help them get started and keep for a long time. Boards come with suitable features such as concave, kick tails, wheel flares and cut outs. 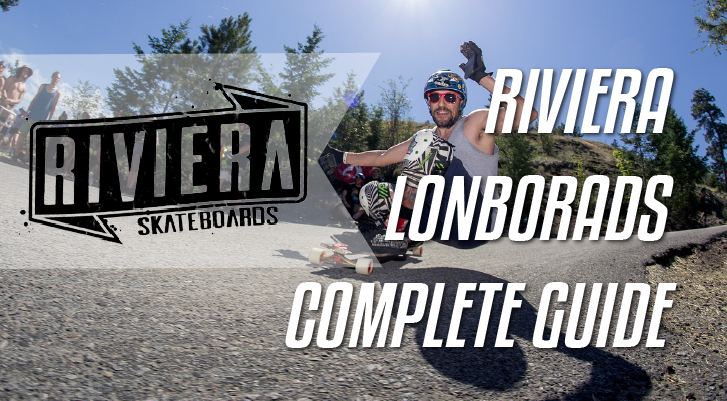 Riviera provides a range of boards that can be used for a different style of riding. Particularly if you are looking for your next free ride or cruising board, as there are many sizes, widths and styles to choose from. Those that are looking to begin downhill and free riding have a number of boards to choose as well. Whilst most boards are made of maple, there are some boards made of combinations of multiple materials to be found here. There are top mounted and drop through boards to be found as well. Whilst Riviera’s completes usually do come with good wheels and trucks. Most of the time the bearings are only ABEC-5 rated bearings. It would have been better if Riviera could supply their boards with higher rated bearings as they will provide much better roll speed and performance. I recommend looking into buying “Bones Reds” as they will provide you much better performance for a relatively cheap price. Some completes may also come supplied with generic, no name trucks or wheels. Meaning it can be hard to gauge whether or not they will perform as well as aftermarket wheels. Chances are you will be way better off upgrading to aftermarket components of your choosing for better performance and a better ride overall. Riviera, listed on our best brands list, describe themselves as a brand born from the “idea that there are no rules when you pick up a skateboard”. Taking pride in their skating and surfing roots, riviera produces a wide range of longboards that fit different types of riding. Riviera also has teamed up with “Paris” and “Divine Wheel Co”. Therefore usually most of their skateboards come with Paris trucks and Divine wheels. Here’s a quick overview of Paris trucks. If you are the sort of rider who is starting out and looking for a simple board that will give you good components and value for money. Then Riviera will most likely be a good choice for you. However if you are an intermediate or downhill focused rider looking for your next ride, you find better options elsewhere.